As we jump into springtime — one of our favorite times of the year — we are chomping at the bit to start preparations for outdoor events with family and friends. That means getting together picnic menus, planting our spring gardens, and planning the ever popular Easter egg hunt. 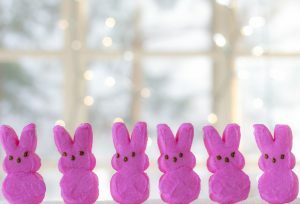 Speaking of Easter, what are your thoughts on Peeps? Many people have a love-hate relationship with the fluffy, marshmallow candy, and most of the time they’re left untouched. However, instead of eating Peeps, why not decorate with them? It’s impossible to stop yourself from buying these adorable treats, so instead, try out one these five creative ways to use Peeps this spring. If you host a big Easter brunch, this one’s for you. Instead of worrying about where people will sit at the table, having assigned seating before is a good solution. Ditch the plain seating cards, and place a Peep in the center of an egg cup with some Easter grass. With scissors, snip a half-inch into the Peep creating a small opening, and place a name card on top. The perfect simple, yet creative home decoration or toy, peep play dough is a fun-filled activity to create with your youngsters. Place five peeps of the same color, one tablespoon of coconut oil, and one cup flower in a microwave bowl for 30 seconds. Mix together the ingredients and knead until firm. Easy, peasy! A favorite with the kids, peep slime is easy and fun to create. Place five peeps of the same color and one tablespoon of coconut oil in a microwave bowl for 30 seconds. Mix together with two tablespoons of cornstarch. Once kneaded, you’ll have a slimey texture the kids will love to play with! Who said Peeps didn’t taste good? In a large microwavable bowl, place one tablespoon of butter, and 10 Peeps of the same color — microwave for 30 seconds. Then add two cups of crispy rice cereal and mix. Into a pan, smooth out the mixture with a spatula. A fun twist on the classic rice krispie treat! This spring, we’re all about creating memories with your loved ones and taking time to enjoy the season. The Degnan Group will help you find the perfect home to create long-lasting memories that will stand the test of time. Contact us today at (419) 345-7808 to get started.